What Is Radial Optic Neurotomy (RON)? Another option exists for patients with severe vision loss in certain types of non-ischemic central retinal vein occlusion (CRVO). 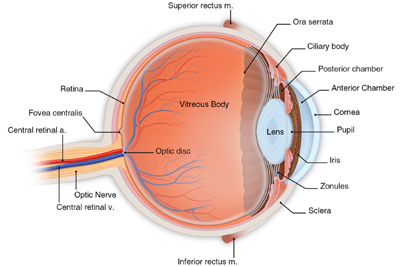 As can be seen in the following diagram, the central artery and central vein that provide blood to and remove waste from the retina lie close together in the optic nerve. A swollen optic nerve, found in some patients with CRVO, can further constrict the central retinal vein as it exits from the eye. This constriction can further exacerbate the occlusion which prevents the blood and waste materials from freely flowing out of the eye. A surgical technique called radial optic neurotomy, or RON for short, has been shown in certain studies to reduce this constriction. Your surgeon will use a small instrument to make a tiny incision in the outer layer of optic nerve where it exits from the eye. This incision releases pressure on the central retinal vein. Patients may see improvement in their vision following RON surgery. Your surgeon may also combine this surgery with a intravitreal injection of triamcinolone acetonide. This will help to reduce retinal edema or swelling. AV sheathotomy is a surgical procedure in which the occluded vein in your eye is separated from the artery that is constricting it. This treatment is used for patients with branch retinal vein occlusion (BRVO). By separating the artery and vein, blood flow can improve, resulting in improved vision. AV sheathotomy has been shown in several studies to be beneficial in certain patients with BRVO. Both RON and AV sheathotomy are done under local anesthesia, and you will also be given a mild sedative. Your eye will be completely numbed, and you will remain comfortable during your surgical experience. After your surgery, you will rest in a comfortable reclining chair. Your family members may then join you in reviewing your follow-up care and schedule. Your surgeon will see you the day after surgery to check how your eye is healing. Some discomfort is to be expected following surgery. You will wear an eye patch for a short time afterwards. You will be given eyedrops and medication to help the eye heal. It will take a month for the surface of your eye to fully heal. Depending on the status of your retina, it may take six months or more to attain your final visual result. Any surgical procedure involves some risks. These risks include infection, bleeding, retinal detachment, high intraocular pressure and accelerated cataract formation. However, most of these conditions can be successfully treated. The potential risks associated with these procedures are less than the expected benefits to preserving your vision. An untreated detached retina can lead to loss of vision in your eye. Therefore, symptoms such as flashing lights, a rapid increase of new floaters, a veil or curtain moving across your vision or a shadow in your sideways or peripheral vision - symptoms that can be indications of a detached retina - should not be ignored. While they do not always mean that you have a detached retina, you should call your doctor immediately. If you do have a tear or a detachment, prompt treatment can prevent serious damage to your vision.